Here is a recipe of a refreshing cold soup for summer that is beautiful to look at and delicious — it was served to us at a restaurant in a hill town in Provence. 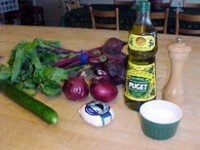 To prepare the soup, put the olive oil, onions, and a half a teaspoon of salt in a saucepan over moderately high heat. Cook for about 10 minutes, stirring from time to time, until the onions are soft. Stir in the wine and let boil a minute, stirring, before adding the beets with the stock. Continue cooking until the beets are soft. 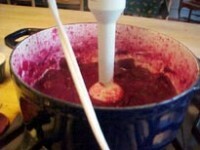 Puree in a blender, a food processor, or with an immersion blender. Season to taste with salt, pepper, and vinegar. Stir in the cream. Transfer the soup to a bowl and chill. To prepare the garnish, cut the cucumber (with it’s peel) into a tiny dice. Coat the cucumber with olive oil and season with salt and pepper. 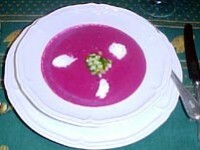 To serve, ladle the soup into bowls, place a generous spoonful of the diced cucumber in the middle of each bowl. And, arrange three small spoonfuls of the goat’s cheese around the cucumbers.